On Thursday 11th August the AFL hosted a dinner in the Victory Room at Telstra Dome to celebrate the 2005 International Cup. With the who's who of international football and the AFL attending, there were awards given out, a FOXFooty segment, cultural performances by some of the competing teams, and a general feeling of goodwill as players and officials mixed at the informal end of the night. 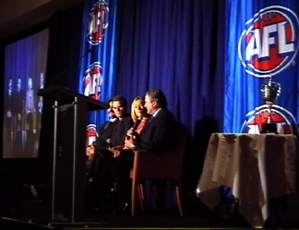 Below are photos from the night and the official AFL press release listing the awards. 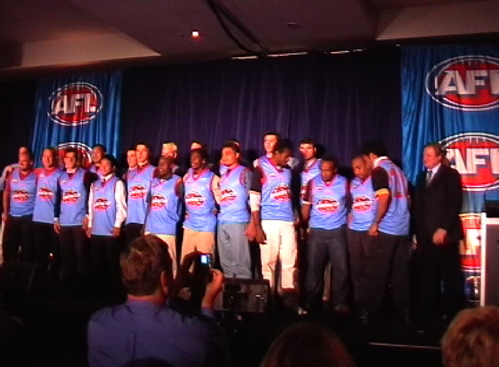 Last night the 10 nations competing in the 2005 AFL International Cup celebrated the success of the event at an official dinner hosted by the AFL. Over 600 guests were in attendance including His Excellency, Anthony Mongalo, High Commissioner Republic of South Africa, the Hon. Justin Madden, MLA – Minister for Sport and Recreation and Minister for Commonwealth Games Victoria, Mr Ron Evans, Chairman AFL, Mr Andrew Demetriou, Chief Executive Officer AFL, Mr Bill Kelty, Commissioner AFL, Bruce Billson, Parliamentary Secretary for Alexander Downer, Minister for Foreign Affairs and the consul generals from all 10 nations. A highlight of the event was the announcement of the 22 players named as the 2005 Australian Football International Cup All Stars Team. As well as being recognised for their performance the All Stars Team were presented with a commemorative jumper and congratulated by Essendon Coach Kevin Sheedy on their outstanding achievement. Navu Maha (PNG), David Gavara-Nanu (PNG), Stanley Tapend (PNG), Alister Sioni (PNG), Richard Bradley (NZ), Andrew Congalton (NZ), Craig Ashton (NZ), James Bowden (NZ), Todd Danks (NZ), James Brunmeier (USA), Donnie Lucero (USA), Michito Sakaki (Japan), Mtutuzeli Hlomela (South Africa), Steven Malinga (South Africa), Clifford Richardson (Ireland), Mike Finn (Ireland), Rob Burgess (Great Britain), Jose Francisco Lorente (Spain), Fia Tootoo (Samoa), Mateta Kirisome (Samoa), Rob McEwan (Canada), Paul Loghanne (Canada). A tie between Fia Tootoo – Samoa and Navu Maha – PNG. Craig Ashton – New Zealand (10) and James Bowden – New Zealand (10). Very creative player who mops up in defence and can play midfield or forward. Keeps his head over the ball. Kicked the sealing goal to get PNG into the Grand Final. Second time nominated for the All Stars Team. Joint winner of medal for 2005 Australian Football International Cup’s Best & Fairest. Key defender with excellent leadership skills. Played with Melbourne University Blues. Consistent performer throughout the Cup. Strong defender/midfielder with exceptional vision and clean hands. Has also played AFL in Malaysia where he is studying. Athletic medium forward with exceptional leap and smart around the goals. Trained with Brisbane Lions (AFL) last summer and then played in Queensland’s AFL Cairns league. Exiting prospect. Strong mark and courageous key forward who proved a terrific target for his team inside 50 metres. Features with some of the top contested marks of the series. Kicked 12 goals for the championships. Strong marking key forward who captained New Zealand and showed terrific leadership as well as a fierce approach to the ball. Dangerous near goal. Lightly built but extremely courageous and strong marking forward who was a consistent avenue to goal. Capped off by four goal performance against the USA helping his team into the Grand Final. Clever medium forward who is very strong in the air and smart around goals. Reads the game well and is very agile. Creative on-baller with good pace and evasive skills – can kick long goals and lift his team with his overall enthusiasm. Medium midfielder/forward with excellent aerial and ground skills. Currently studying language at Macquarie University (NSW) as part of the USA/AFL Scholarship. Captained his country and played consistently in defence being strong overhead and a good kick. Ex-Marine who has seen active service for his country. Small midfielder who played with tremendous heart for his team winning many possessions and hitting his targets with hand and foot. Outstanding all series including against Great Britain where he virtually set up all his teams goals. Tutu was his teams captain and he led with great courage and skill. Has clear ball handling skills and kicks strongly. Had a year with Sturt (South Australia National Football League) in 1998 and will soon begin new full-time position as Head Coach of AFL South Africa. Small forward who showed tremendous courage not only in the air, but at ground level and when the opposition had the ball. Takes spectacular marks, and kicked some team-lifting goals including 5 goals against Spain. Tackled bravely all championships for his team and played with great heart. Powerfully built key forward who marked strongly for his team and kicked important goals. Has a rugby background and currently studying in Edinburgh in Scotland. Talented Gaelic footballer who played in a range of positions and provided excellent drive for his team. Very athletic and strong in attack on the ball. Accumulated many possessions for his team in the midfield and also read the play well cleaning up across half-back. Fine contributor and hard worker throughout the Cup. Hard working inside midfielder who lead the Bulls on-ball brigade with desperation and energy. Studying law in Spain as a result of his relationship with Spain’s coach Jeff Callow – who himself practices law. Strong marking key position player who provided a target up forward when needed for his team or a physical presence on-ball and in defence. Star in the first International Cup for his country in 2002 and backed it up again with some top performances being a joint winner of the 2005 Australian Football International Cup Best & Fairest medal. Medium sided midfielder with terrific hands who worked hard for his team and was very creative setting up many forward moves. Medium midfielder who is strong in the contest and sent his team forward on many occasions. Played an excellent game for his country against Ireland in his best performance. School teacher in Windsor. Skilful rover who has good game sense and smooth skills. Has the ability to find space which could be attributed to spending some time in Ireland playing Gaelic football. Excellent against Samoa. Why is Paul Maalona from Samoa registred for kicking 14 goals on The Footy Record, but Craig Ashton and James Bowden won the leading goal kicker with only 10 goals??? Is the Footy record inaccurate??? Craig Ashton is only registred for 6 goals on the record?? I'll let you know when we have it. Lots of loose ends to tie up!